There’s nothing quite like a happy accident that comes in the form of a delicious frozen treat. This endeavor began as an attempt to create Frozen Macaroons. Sounds yummy, right? I might have jumped in feet first to one of the hardest pastries to create, and managed to land on my feet. It took a little detour, but tastes just as delicious. While my recipe did not yield a fluffed crunchy shelled macaroon, I did end up with a crispy, chewy cookie perfect for sandwiching our favorite frozen treat between. 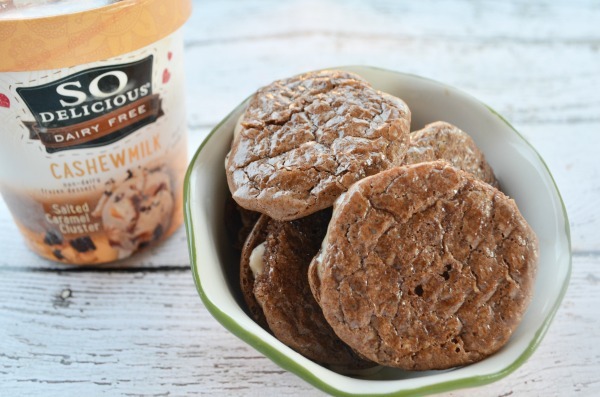 They taste just like the gluten-free cousin of our brownie cookies. 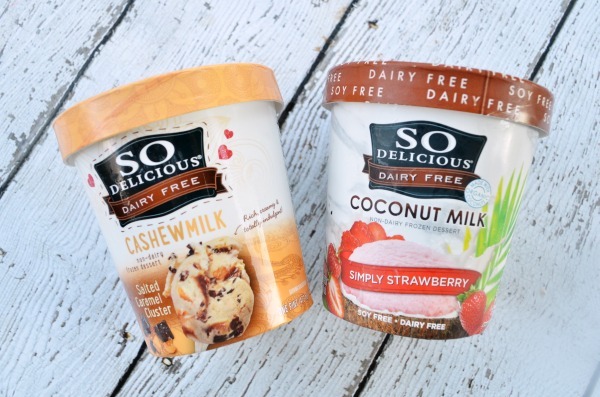 So Delicious® products are Non-GMO Project Verified and 100% plant-based. This is one frozen treat I don’t mind feeding the whole family, with no artificial colors, flavors, preservatives, or high-fructose corn syrup. 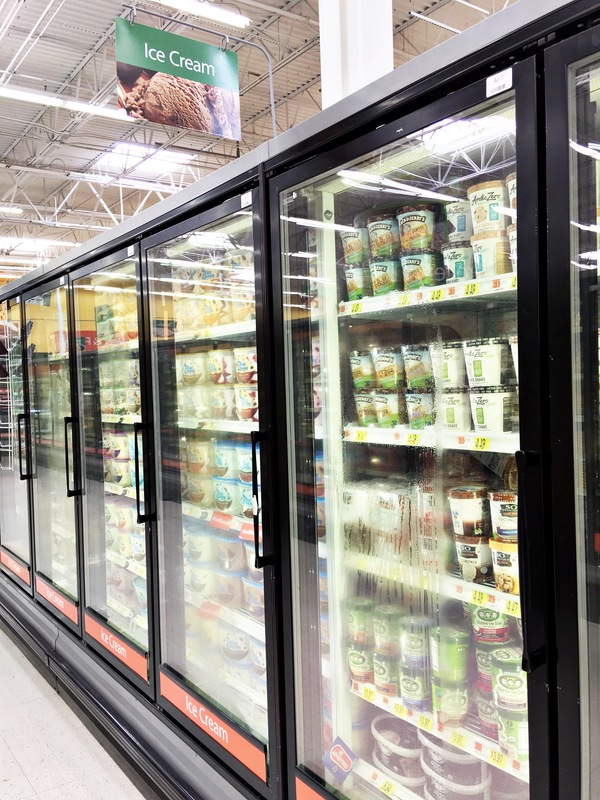 Checkout Walmart for a variety of So Delicious Dairy Free® Frozen Dessert flavors right in the frozen foods aisle. 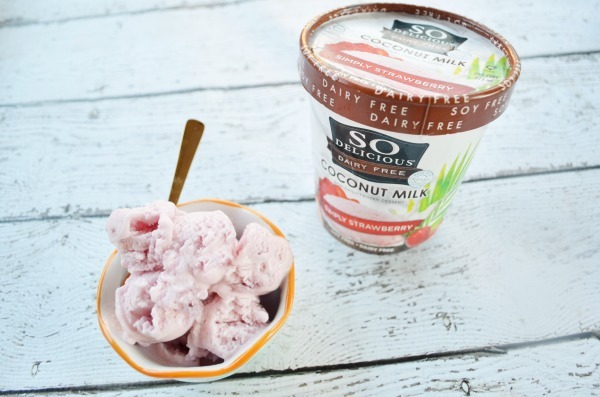 Our favorite variety on a hot summer day is the Coconut Milk Simply Strawberry, yum! While it tastes delicious on it’s own, I decided to kick it up a notch by adding it to a frozen cookie sandwich. Keeping in line with the dairy-free theme I went with a dairy-free and gluten-free chocolate cookie crisp. 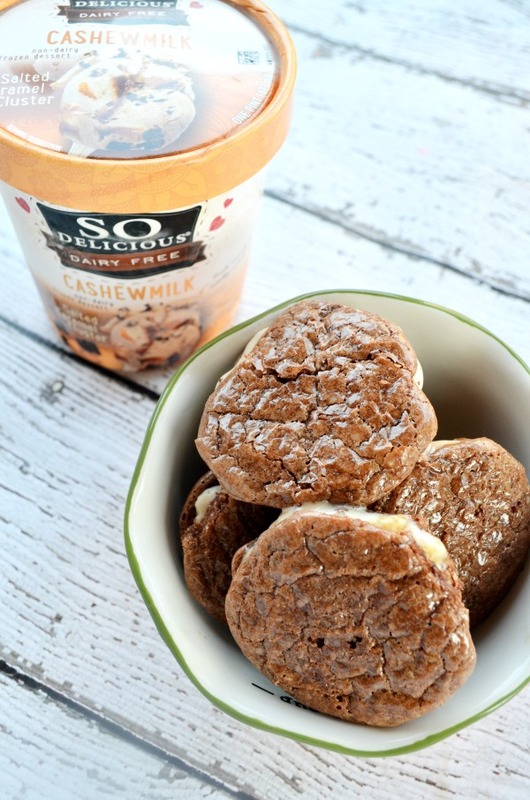 Then we’re sandwiching Cashew Milk Salted Caramel Cluster frozen dessert right in the middle. 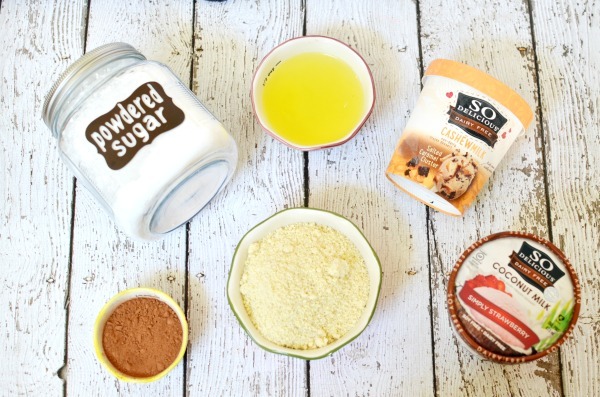 For the cookie all you need is 4 ingredients: almond flour, powdered sugar, cocoa powder, and egg whites. 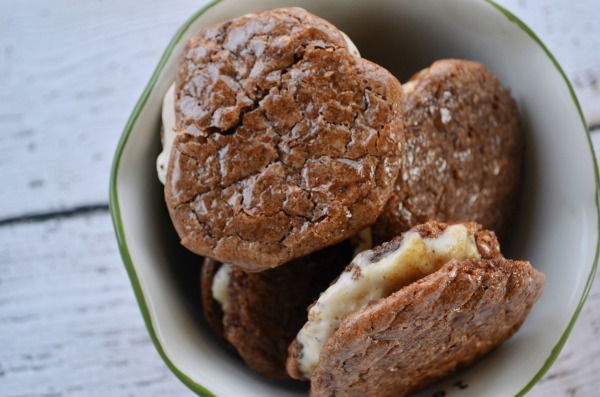 To create these frozen cookie sandwiches you’ll need to bake the cookies first. Whip the egg whites and 2 tbsp. powdered sugar together in a mixing bowl. Sift the prepared dry mixture into the egg whites. Transfer to a piping bag. Pipe cookie batter directly onto parchment lined baking sheets. Bake cookies 12-14 minutes in a 300°F oven. 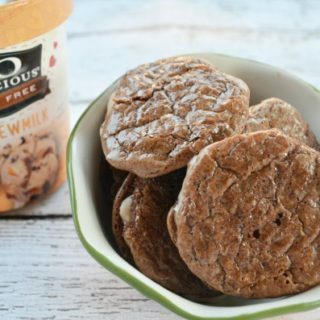 Once the cookies have cooled completely place a scoop of So Delicious Dairy Free® Cashew Milk Salted Caramel Cluster on the bottom of one cookie. Place a second cookie on top and push together. Transfer cookie sandwiches to the freezer to firm up for at least an hour. Serve up 1-2 cookies each, enjoy! 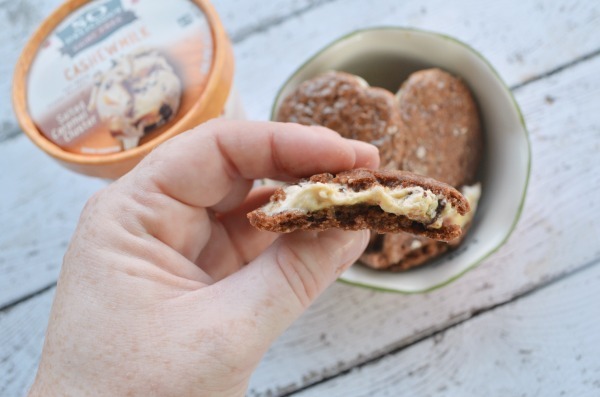 Dairy-Free Salted Careml Cluster Frozen Dessert sandwiched between 2 crisp and chewy gluten-free chocolate cookies. Preheat oven to 300°F. Line two baking sheets with parchment paper. Prepare a large pastry bag or storage bag with a medium round tip. Give the bag a twist right above the tip and place inside a tall glass with the top draped over the edges. In a food processor, process the almond flour (1⅓c.) and powdered sugar (2c.) on high for 2-3 minutes. Make sure not to overheat the mixture as it can cause the oils to release from the almond flour and stick. Take breaks through processing to stop and scrape the sides. Sift the dry mixture and cocoa powder (1/4 c.) through a large sieve, set aside. In a large mixer bowl, whip egg whites (1/2c). Add 2 tbsp. powdered sugar as soon as the egg whites start to gain volume. Whip the egg mixture until they are firm, and little peaks form. Slowly add and gently fold the dry mixture into the egg whites. Spoon the batter into the pastry bag. Pipe 1 inch circles onto the parchment lined baking sheets. They should spread into 2 inch patties. Bake cookies 12-14 minutes at 300°F. Place cookie sheets on the middle rack until tops are firm to the touch. Once cookies are cooled completely flip half of them over. 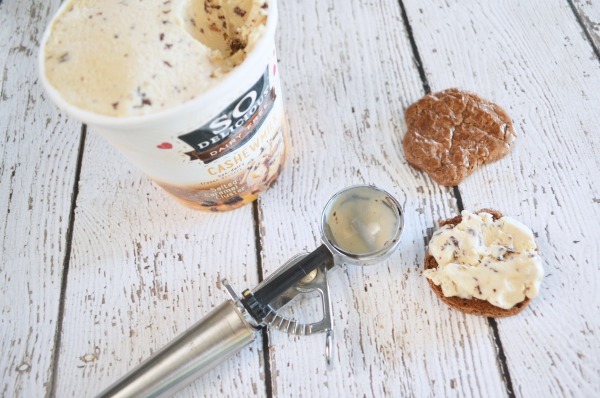 Using a small cookie scoop place 1 scoop of softened So Delicious Dairy Free® - Cashew Milk Salted Caramel Cluster Frozen Dessert to half the cookies. Place a second cookie on top and push together. Transfer baking sheet to the freezer for 1 hour to firm up. *TIP: Place a legal size piece of paper with perfectly spaced circles drawn under the parchment paper. Pipe batter on the parchment, using the circles as a guide. Remove paper prior to baking. You could also grab your favorite macaroon and add a little So Delicious Dairy Free® frozen dessert to the middle. 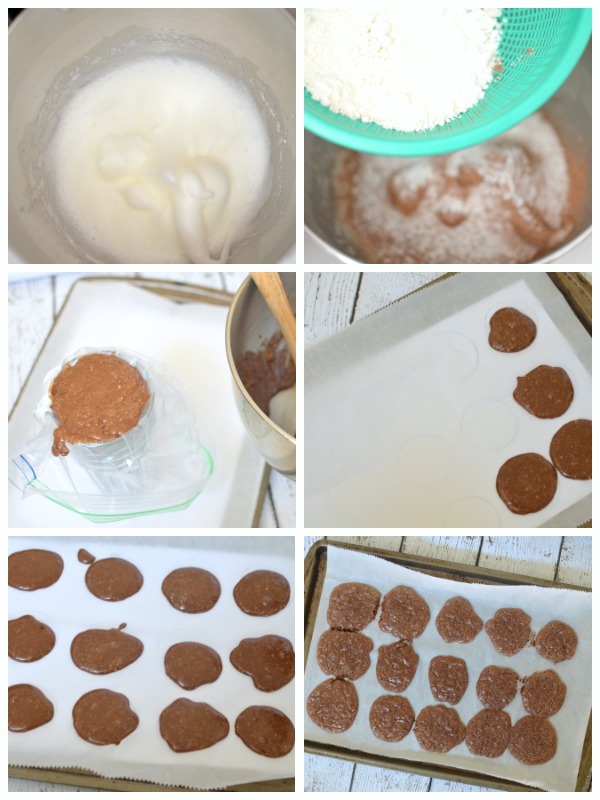 That is a frozen macaroon made easy. Find even more frozen dessert inspiration here.